Do fossil gaps disprove evolution? One of the issues most frequently raised by both creationist and intelligent design writers is the question of gaps in the fossil record. These writers assert that there are large, unbridgeable gaps, and that the conventional scientific picture of a smooth sequence of species through the ages is a myth. It is not entirely clear what proposition the creationist and intelligent design writers would insert in the place of evolution in this regard, but these criticisms are nonetheless prominently featured in their writings. Creationist Henry Morris, for instance, asserts that there are "systematic gaps" in the fossil record, and "There is no evidence that there have ever been transitional forms between these basic kinds." [Morris2000, pg. 78-79]. In discussing this issue, one first must carefully define the context. Does one mean a "gap" that had been identified in Darwin's time, or one that was identified in the mid-twentieth century, or one that exists now? After all, at least one if not more transitional fossils have been found for virtually all gaps thought to exist in Darwin's day. Along this line, if one transitional fossil is found for a given gap, does that mean that two more gaps have suddenly appeared and must be filled (one on each side of the new fossil)? This is obviously a game that no amount of scientific research can ever fully satisfy. Also, the notion of "kind" as used by creationists such as Morris is a very slippery one. In some contexts, these writers seem to mean whole phyla or other groups of organisms, but in other instances they seem to refer to individual species, such as in their discussions of prehuman fossils. Either way, numerous transitional fossils have been found. For additional discussion on prehuman fossils, see Prehuman fossils. It must be kept in mind that the discovery of a fossil is a highly fortuitous event. Almost all biological organisms that have ever lived were either eaten by predators or otherwise destroyed soon after death, leaving no trace. Most that persisted in some form (e.g., as skeletons) were later destroyed by chemical effects, or were part of a geological layer that subsequently disappeared into the Earth's molten mantle. Almost all fossils that have survived these and numerous other perils are far beneath Earth's surface and will never be found by humans. Only a tiny fraction of fossils are so fortunate as to be within a few meters of the surface, at a location where geologists and paleontologists can find them [Prothero2007, pg. 51-52]. Nonetheless, many significant transitional fossils have have been found over the past few decades, filling "gaps" that once were thought to be well-nigh unbridgeable. In general, the paleontological (fossil) history of the Earth is now much better understood than even a decade or two ago. Original multicellular life. Some creationists have questioned whether there was any advanced, multicellular life before the "Cambrian explosion" approximately 600 million years ago. Creationist Henry Morris, for example, asserts, "There is obviously a tremendous gap between one-celled microorganisms and the high complexity and variety of the many invertebrate phyla of the Cambrian. If the former evolved into the latter, it seems impossible that no transitional forms between any of them would ever be preserved or found." [Morris2000, pg. 81]. While early multicellular creatures did not have any bony structures, and thus did not leave significant fossils, numerous lines of evidence point to the existence of such organisms well before the Cambrian explosion of 600 Myr ago. One particularly striking recent discovery was announced by some researchers in Gabon (on the east coast of Africa) in June 2010. They found more than 250 multicellular specimens in an excellent state of preservation, which they were able to date, using some very sophisticated state-of-the-art equipment, as 2.1 billion years old [SD2010]. Also, in August 2010 a team of researchers from Princeton University discovered some pre-Cambrian sponges in Australia that have been dated to 640 million years ago, which makes them the oldest known animal fossils [ODonoghue2010]. Marine-land mammal transition. Both Duane Gish (a leading creationist scholar) and Michael Behe (a leading intelligent design scholar) have questioned whether scientists would ever discover fossils linking the hypothesized transition between land mammals and marine mammals. Gish, for example, has highlighted his presentations on this topic by displaying a cartoon of "Bossie" the cow, "Blowhole" the whale and a ridiculous intermediate creature between a cow and whale [Gish1985, pg. 78-79; Prothero2008, pg. 318]. Behe, for his part, wrote "if random evolution is true, there must have been a large number of transitional forms between the Mesonychid [an ancient land-based mammal] and the ancient whale. Where are they? It seems like quite a coincidence that of all the intermediate species that must have existed between the Mesonychid and whale, only species that are very similar to the end species have been found." [Behe1994]. This is an approximate family tree, and, for instance, temporal relationships are not indicated clearly. For a fully detailed version, see [Thewissen2002; Zimmer2001, pg. 138]. The full-sized graphic is available from the PNAS site. Details of the research are available at [Frazer2013; Near2013]. Dinosaur-bird transition. Since the discovery of the original archaeopteryx fossil in 1860, numerous fossils have been found confirming a hypothesis originally made by Thomas Huxley that birds are modern descendants of dinosaur-like creatures. With regards to the archaeopteryx fossils, the current consensus is that although they were feathered dinosaurs capable of flight, most likely they were not ancestral to modern birds [ODonoghue2011]. However, other recent fossil finds have illuminated the transition between dinosaurs and birds. In 2008 Chinese paleontologist Xu Xing and his colleagues documented what appears to be the simplest type of "protofeather," which was seen in a therizinosaur fossil. Other fossils show feathers gradually became more complex, turning into the veined feathers suitable for flight [ODonoghue2010c]. Another remarkable development in this area was the 2010 discovery by Xu Xing's team of a 160-million-year-old dinosaur fossil in northwestern China that had a bird-like keel-shaped chest and a long beak, yet also had three toes on each leg like a dinosaur. Kevin Padian, a noted paleontologist and dinosaur expert at U.C. Berkeley, said, "This is another salvo that blows apart the claims of the 'birds are not dinosaur' crew." [Perlman2010]. As a result of these and other findings, the overwhelming majority of paleontologists are now convinced that modern birds are descendants of dinosaurs. A nice overview of recent research in this field is given in a Quanta article by Emily Singer [Singer2015]. Toothless mammals. Biologists recently uncovered evidence in both the fossil record and the genetic record (i.e., in DNA) of the common ancestry of mammals with and without teeth. Most mammals have teeth capped with enamel, which is the hardest substance in the vertebrate body. However, there exist mammals without mineralized teeth (baleen whales, anteaters, etc. ), and mammals with teeth that lack enamel (aardvarks, pygmy sperm whales, etc.). Further, the fossil record documents when enamel was lost. Recently researchers have identified the mutations that disrupt how the enamelin protein is coded [SD2009], and have even identified genetic evidence confirming that the origin of baleen and the loss of teeth both occurred in the common ancestor of modern baleen whales [SD2010c]. Prehuman species. At least 20 distinct prehuman species have now been identified during the past seven million years. A recent version of the family tree of prehuman species is shown in Prehuman fossils. Again, the sheer number of distinct species, even if some are later shown not to be in the direct path of humans (which is likely), clearly makes a mockery of the popular notion that there is an unbridgeable "gap" between apes and humans in the fossil record. Many other examples could be listed. Several hundred transitional fossils are listed in [Hunt1997], yet even this is only a partial collection and is now more than 20 years out of date. 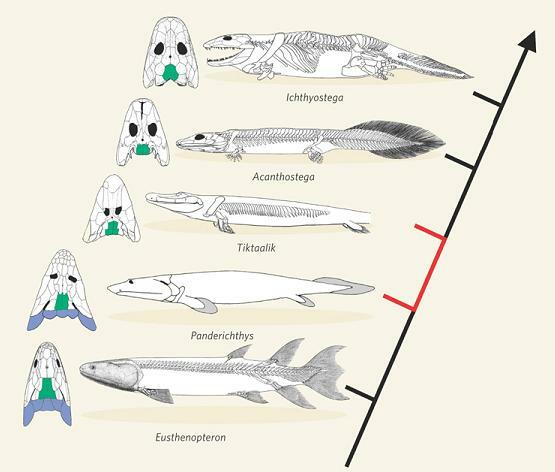 For instance, the Tiktaalik fossil, among many others, was not known at the time this list was prepared and thus is not included. Mark Issak's book lists numerous examples of transitional fossils [Isaak2007, pg. 113-118]. At the present time, perhaps the best single reference for fossils, and counters to creationist-intelligent design claims about fossils, is Donald Prothero's book Evolution: What the Fossils Say and Why It Matters. It includes a very nice recent treatment of this general topic, including mention of numerous transitional fossils with many lovely illustrations, some in color [Prothero2007]. One other good recent reference is Daniel Fairbank's book Evolving: The Human Question and Why It Matters, which describes in some detail how many details of human anatomy, ranging from our eyes to our arms and feet, have their precursors in the fossil record [Fairbanks2012]. A good summary of some ongoing research in this arena is available in a February 2013 New Scientist article [Hecht2013]. Yes, there are gaps in the fossil record. But the fossil record, as has been studied by paleontologists to date, is clearly incomplete. Almost all creatures that ever lived left no trace whatsoever, since the formation of a fossil requires a fortuitous combination of rare events, and almost all fossils that have been formed have either been subducted into the Earth's mantle or else are far underground and will never be seen by humans. In spite of these limitations, hundreds of "gaps" thought to exist in earlier decades have recently been filled rather well by the discovery of transitional fossils, and there is no indication that the remaining gaps are in any way fundamentally different than those that have already been filled. So it is not clear that at this point in time that the "gap" argument against evolution has any remaining substance. Furthermore, insisting, as some creationist and intelligent design writers have done, that two additional gaps now need to be filled whenever a transitional fossil is found is a game that science cannot win. Nor can religion win at this game, since the search for "gaps" in the fossil record is a classic "God of the gaps" theological error, having left a legacy of disillusionment through the ages as scientific research continues its relentless advance. With new and ever-more-remarkable fossil finds now being announced in widely read news sources on almost a weekly basis, those who continue to insist that "gaps" disprove evolution will only heap ridicule on themselves, even in the public eye. For additional related discussion, see Prehuman fossils, Novelty, Punctuated equilibrium, Speciation and God of the gaps.